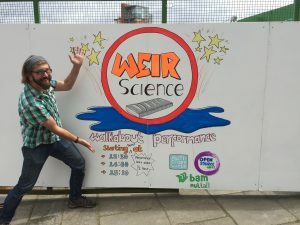 Weir Science was Multi-Story Water’s third and final performance contribution to the Leeds Waterfront Festival, which takes place annually on the last weekend in June (previous contributions were 2015’s Seven Bridges and 2016’s After the Flood). 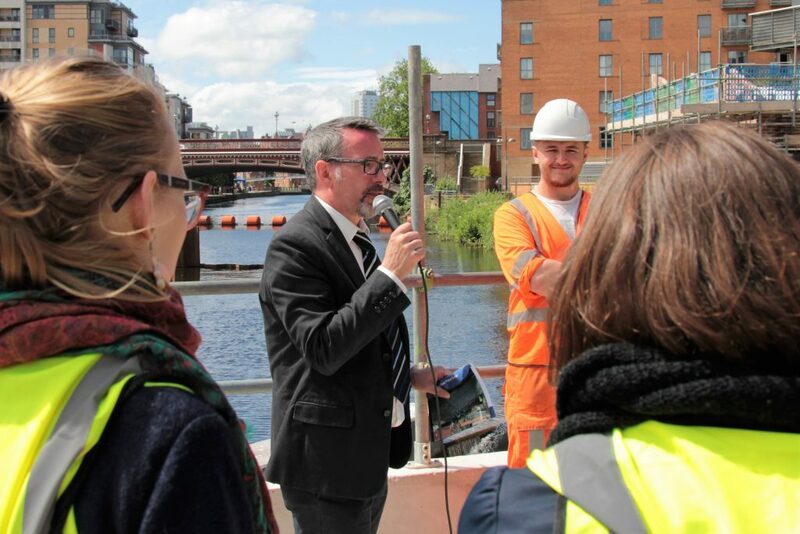 This performance was presented in collaboration with BAM Nuttall, the engineering contractors responsible for the delivery of the £47m Leeds Flood Alleviation Scheme (commissioning partners include Leeds City Council and the Environment Agency). 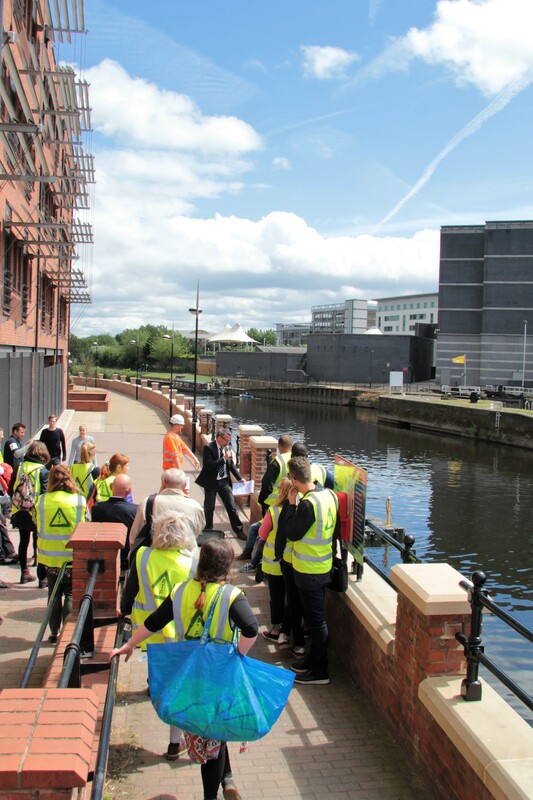 The FAS scheme (and indeed the performance) centres around a retractable weir system, installed in place of two of the city’s old, industrial weirs. 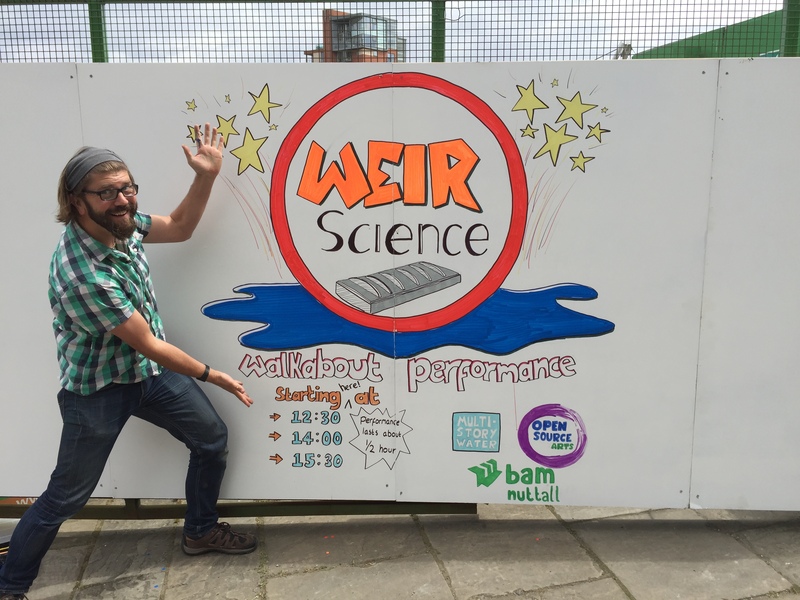 The task of Weir Science was to engage the general public with this scheme, during the festival weekend, in an entertaining and informative way. 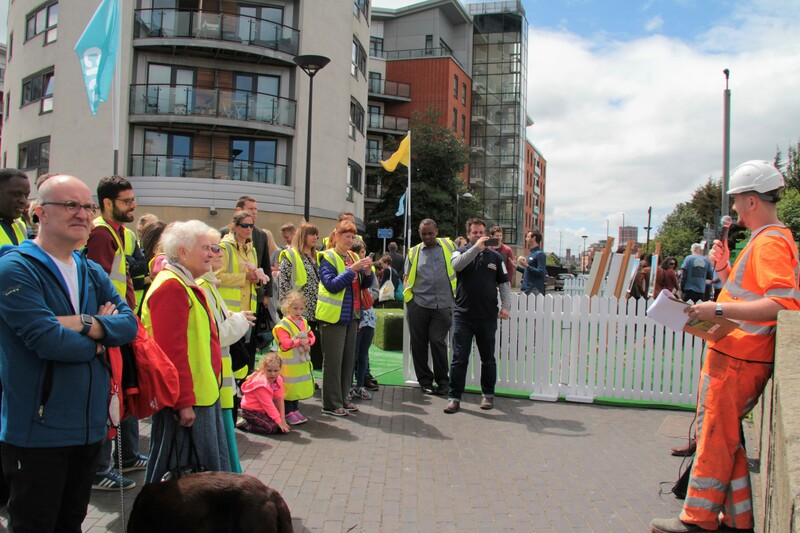 this blog post, reflecting on the performances and public responses to them. In what follows below, we offer an illustrated version of the script for the walkabout performance, as well as selected video clips. ONE: We begin in the FAS site compound, next to the River Aire at Crown Point. GUY is dressed in a suit, tie and loafers. JACK is in head-to-toe orange construction worker gear with hard hat. Both have clipboards, and they pass a mike between them as necessary. JACK: (leaning into mic, deadpan) … of all trades. JACK: …and I’m the one actually building it. … we just deflate the airbags to lower the weir gate, and so lower the level of the river coming through Crown Point… If it rains even harder, we lower the gate further…. … And that way we don’t have to look at Jack any more! (forced laughter) Now Jack, what are these strappy things on the front…? GUY: Brilliantly simple really. (Just like Jack here.) And yet also innovative! This is a first for Leeds – it’s the first time in this country that this technology has been used as a flood alleviation measure. GUY: And then there’s what we call the “linear works” – because they’re all in a line, basically! 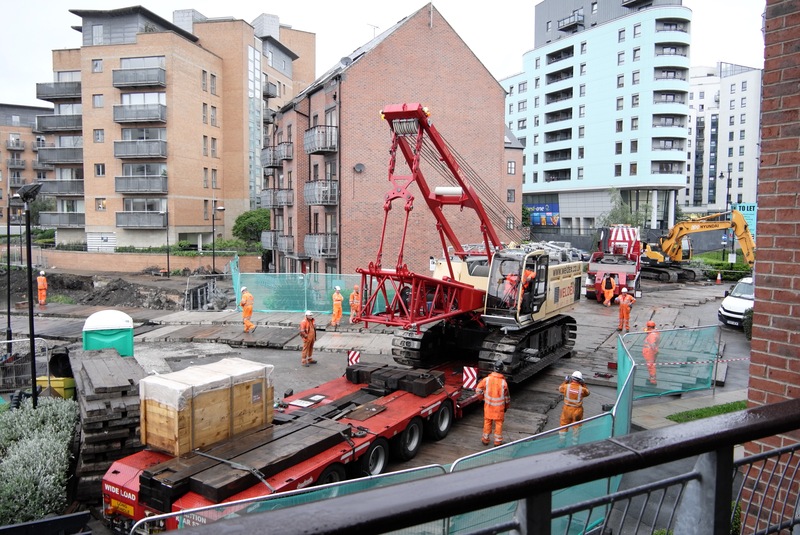 That’s the new flood walls that you’ll see through the city centre, up as far as the station. 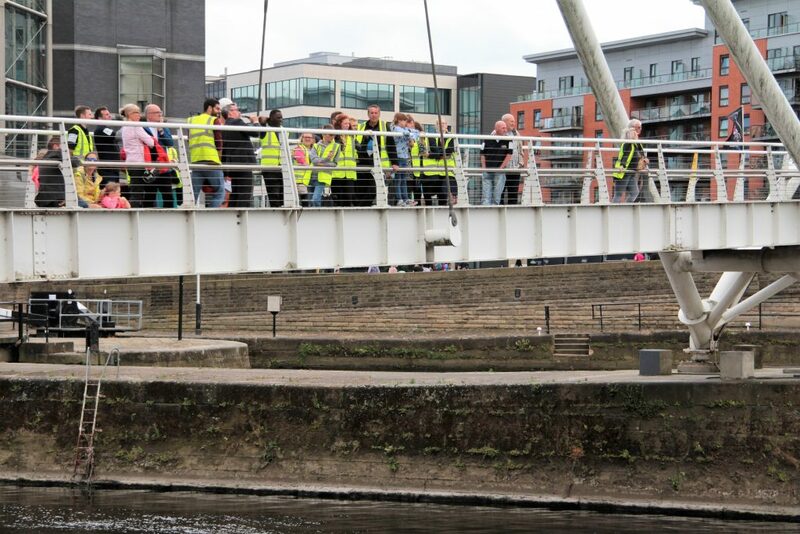 JACK: That’s the bridge by the Dalek building – Neville Street…? GUY: So – not even as far as the station. Usually a big flood scheme will cover a much wider area, geographically speaking. But this is the centre of Leeds we’re talking about! Better flood protection here will mean that people are more likely to invest in this city… particularly in all the disused areas on this Southern side of the river… (fast, as if reciting terms and conditions) We reckon there’s potentially 35,000 new jobs in regenerated brownfield sites in the city centre… (in conclusion:) So we at the Council really fought for this scheme — and we’re underwriting the costs, basically! JACK: (getting impatient) Are we going to start this tour, then? GUY: Yes, right. Don’t you need to do a safety briefing or something? Observe all safety signs and instructions. Interfere with or misuse anything provided for health, safety and welfare. Pump water into the river without permission. JACK: (scanning list) Yeah, the rest of this isn’t really relevant… OK let’s go! 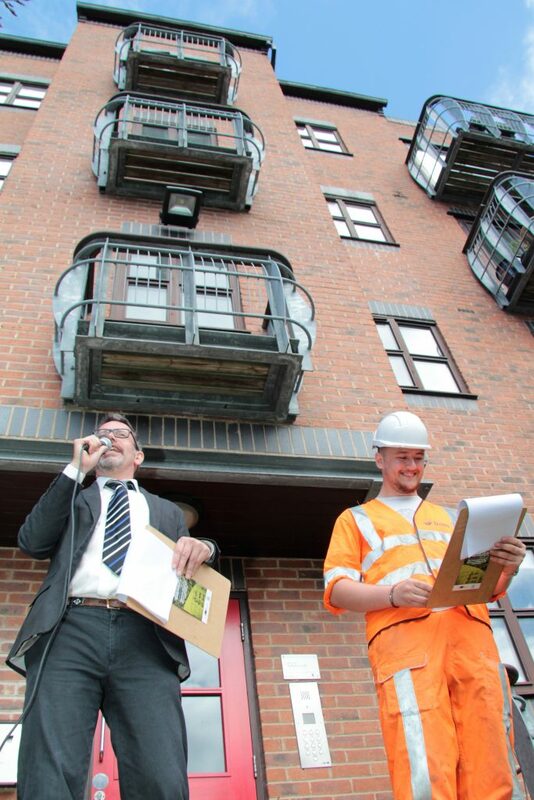 GUY: (scuttling along behind) Ha ha ha, he’s not just your average hairy-bottomed builder is he…?! TWO: At the base of Knight’s Way bridge, overlooking the navigation and Fearns’ Island. JACK: (with the mic, as audience… as if sharing a confidence) You know, people in suits and ties sometimes look down on construction workers. Some of them think we’re just monkeys in hard hats. They forget that we might have decades of operational experience. They forget that we’re so highly skilled that we get moved around the country in teams, to where we’re most needed. Whether it’s power stations. Motorways. Weirs… I’m from Hartlepool, myself. I’m down here working in Leeds all week, and I only get back up to see me missus on weekends. Although this weekend I’m stuck here doing this… So I’m just saying. Let’s not take people for granted. Case in point. They want us to build this weir, but we have to figure out the logistics of actually doing it… How do you think we got this massive crane up on the island here? Then we lowered 4 massive steel tubes into the channel, at the narrowest point just there. These are like pipes, to let the water through. GUY: (shamed) Well, that’s fair enough I suppose. And actually, in one sense, this whole project is for the benefit of boaters… I mean, one way to lower the river levels in Leeds permanently would just be to take the weirs out completely… but if we did that, then this navigation section just wouldn’t work at… boats wouldn’t be able to get through here at all… So it might not look like it, but that weir is really all about boats! Something to think about! GUY: As we keep moving, do take a look at Fearns Island here – in the middle of the river. Anyone remember the ugly blue asbestos-filled huts that sat on there for years and years? In the end it only took ‘em a day or two to take them down, didn’t it Jack!? (calling back, JACK ignores him) So there’s an interesting question what’ll happen to this island once the works have finished. What do you reckon…? Urban park? Wildlife sanctuary? 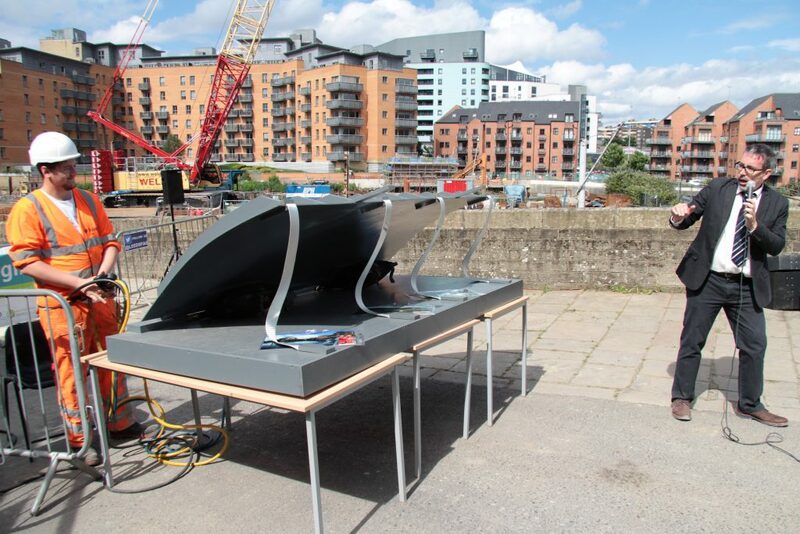 Yet another waterfront bar…? Then we come to the first completed weir section, with its waterfall effect — can you imagine the air bags underneath that…? And then finally we have the the coffer dam, where they’re building the second weir section… Jack, can you explain to these good people what exactly a “coffer dam” is? GUY: And is it watertight, this box? JACK: I’d say 99%. Inevitably you get small leakages but we have a pump system to deal with that. 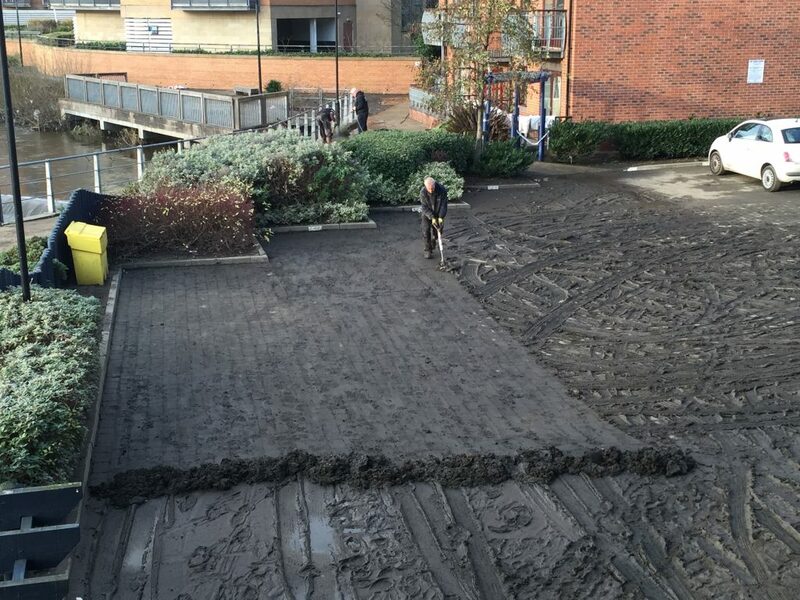 GUY: Now – this coffer dam is blocking off about half the width of the river… so is it not adding to flood risk, while it’s there…? GUY: What’s that big concrete structure we can see, inside the coffer dam? JACK: That’s the fish pass. 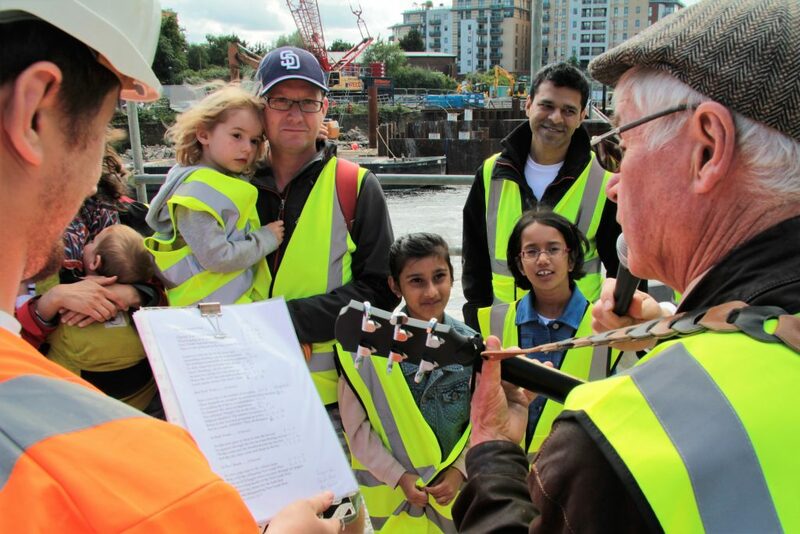 It’s actually the first thing we built here, so that we could use it as a sluice gate while we were building the first section of the weir… So that’s like another kind of overflow mechanism. GUY: Oh, I see — so in high water, you could just open the sluice gate and let more water through? GUY: Now, ladies and gentlemen, the fish pass is a big, important part of this scheme. For centuries this weir has acted as a significant obstacle for fish wanting to get upstream to spawn … but now, as part of this scheme, they’re going to have a lovely sort of escalator over here to get upriver… And the really clever part is that the heritage weir, over here, will work as the down escalator, for when the fish go back towards the sea… So you can tell they’re English fish, because they’ll be driving on the left! So we’re expecting a surge, ladies and gentlemen! Once this scheme is completed! And we’re hoping that, eventually, we’ll have salmon getting up as far as Gargrave to spawn. 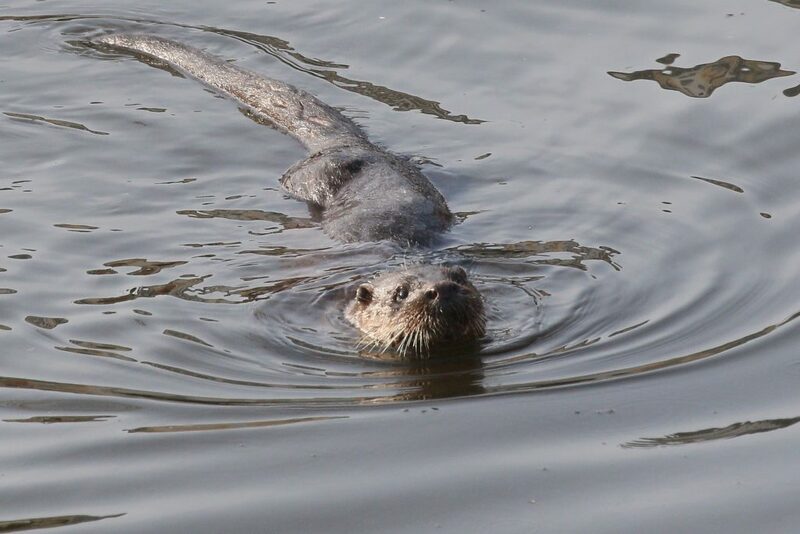 … So anyway, the water’s deeper, so there are already better fish stocks, and you’ll see cormorants and other fishing birds all the time here now… There’s even an otter! It sits over there sometimes, in the culvert, just watching the river… Watching us, maybe. It doesn’t seem at all phased by the noise or the machinery …. It’s only really scared of people. GUY: Oh one more thing! Before we head off…. 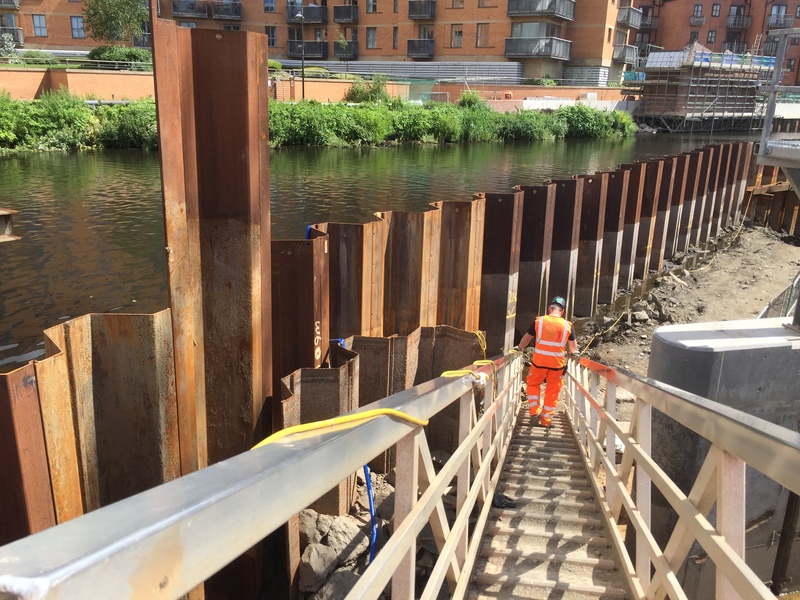 Just take a look at the new flood walls that Jack and his colleagues have built over on the river bank here… Notice how the new wall is blended in with the red brick around it… further upstream, we’ve got sandstone facing blending with sandstone… This scheme has to be right for the city! Fortunately, we live higher up, so we didn’t have water in the apartment. But we were basically trapped for 3 days, because this place was like an island! Completely surrounded by water, well out to the main road… Luckily we had plenty of food in because it was Christmas, so, you know, Blitz spirit and all that! But let me direct your attention now to the operating booth for the new weir gates, just over here… The building’s not quite finished but the systems are all installed inside already… There’s a big dial that says “Bladder Control”. I could probably do with fitting one of those! (ha ha ha) No but seriously folks, this is a big undertaking for us – thinking about the continued maintenance and operation of these weirs… Normally a big scheme like this would be run by the Environment Agency, because they have lots of operating experience with these things… But because it was the city council that really pushed for the installation of this system, it’s also the council that’s taking key responsibility for running it… and we’re really on a massive learning curve – trying to run all the scenarios for what we’d do in situation x, y or z … how we’d calibrate the weir heights… because every flood event is different, as we’re discovering! But there is a real will to make this work. There is a real will and commitment for us to be doing what we can for our city! 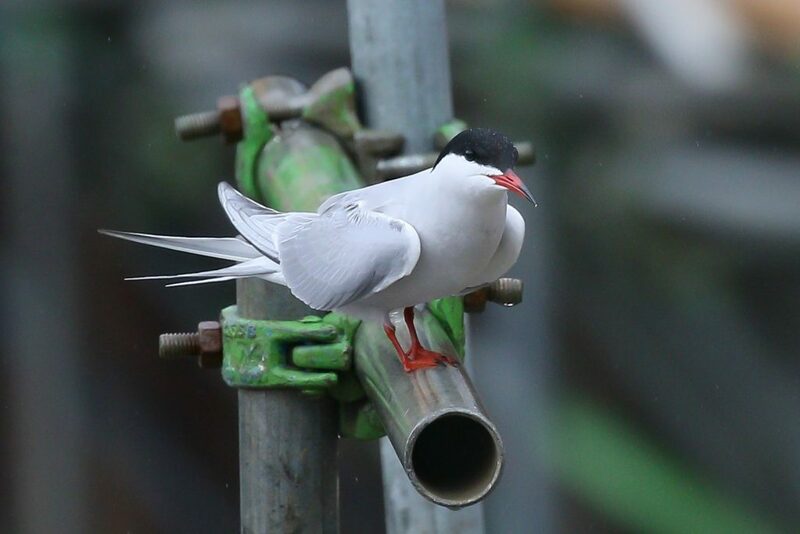 Working around that nest cost about a week and a half’s progress on site…that means overhead costs of something over £70,000… So that’s one expensive nest! Now, what does that mean, I hear you ask? Since we had a big flood here two years ago, does that mean there won’t be another one for 73 years? Unfortunately not! Jack, can I have that demonstration model, please? 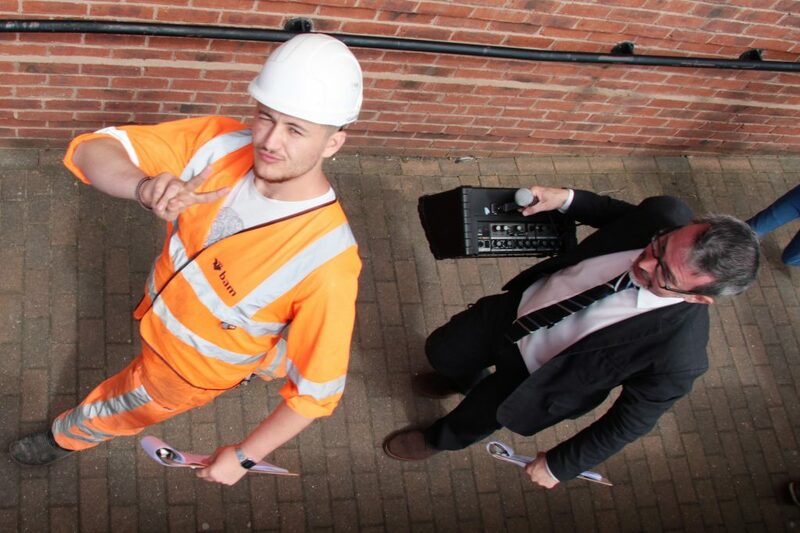 Let’s explain this using a metaphor we can all understand – the National Lottery! Only in this case, it’s the British Weather Lottery, which I think we’re all pretty familiar with… Here we have 75 ping pong balls, in hazard orange (JACK pours them into big tub) Now – one of these balls represents a major flood event. A 1 in 75 year flood event! (he pulls it out, marked with black) Which means that, in any given year, there is a 1 in 75 chance that we’ll be hit by that level of flooding… like a ball coming up in the weather lottery! But here’s the thing — if that ball comes up one year (throwing it back into the tub, shaking the balls up) there’s still a 1 in 75 chance that it’ll come up again the next year… and the next year after that… Now, admittedly, it’s getting pretty unlikely – in statistical terms – that something like that would happen repeatedly – but still, it could happen. That’s probability calculations for you! Now, as it happens, we;ve done some more work on the modelling since the scheme was designed, using new data — some of it from the Boxing Day flood — and we now reckon that it actually offers us better than 1 in 100 year flood protection! Ladies and gentlemen, thankyou so much for joining us on our little tour. 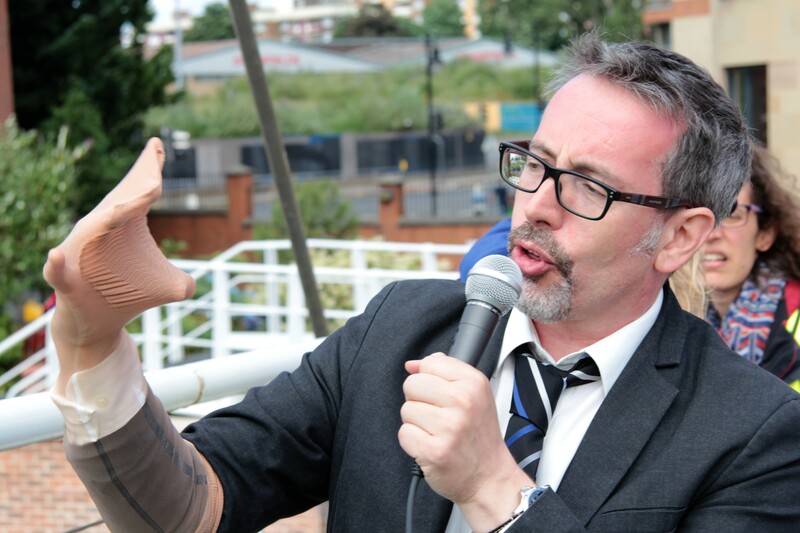 I’d like to thank my glamorous assistant, Jack…. (applause) … And I’d like to introduce you to my good friend Eddie Lawler, who is going to play us out with a song he’s written specially for this occasion… Eddie Lawler!